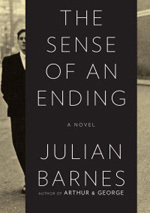 Suzanne Dean, Creative Director at Vintage Publishing, discusses her process for designing the cover of Julian Barnes's The Sense of an Ending. The video shows numerous examples from her earliest design thoughts through the final cover. 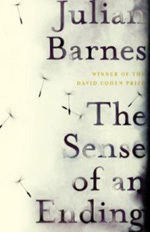 Suzanne Dean also designed the jacket for Julian Barnes's recent collection of short stories Pulse. Dutch - Alsof het voorbij is. Amsterdam/Antwerpen: Uitgeverij Atlas, 2012. Pp. 160. ISBN: 9789045022673. French - Une fille, qui danse. Collection Bibliothéque étrangère, Mercure de France, 2013. Translated by Jean-Pierre Aoustin. ISBN: 9782715232495. Galician - O sentido dun final. Rinoceronte Editora, 2012. Pp. 164. Translated by Xesús Fraga. ISBN: 9788492866427. German - Vom Ende einer Geschichte. Köln: Kiepenheuer & Witsch, 2011. Pp. 192. Translated by Gertraude Krueger. ISBN: 9783462044331. Romanian - Sentimentul unui sfarsit. Bucuresti: Nemira, 2014. Pp. 178. Translated by Radu Paraschivescu. ISBN: 9786065796713. 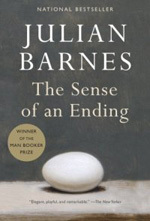 Spanish - El sentido de un final (The Sense of an Ending). Barcelona: Editorial Anagrama, 2012. Pp. 192. Translated by Jaime Zulaika. ISBN: 9788433978523.